The New York 5 Boro Bike Tour Riders Will be Snacking on Nature Addicts this Weekend. Nature Addicts, the 100% non GMO verified fruit snack, is an official partner of the 5 Boro Bike Tour taking place this Sunday, May 1st. On May 1st, America largest charity bike ride, the 5 Boro Bike Tour will welcome 32,000 cyclists of all levels to ride through every borough of New York free of cars. Beginning in Lower Manhattan, the 40-mile tour has 4 rest areas with Nature Addicts' fruit snack available for everyone to enjoy at 2 of the rest areas - Harlem and Long Island City. 100% Natural – with no additives or preservatives, gluten-free, non -GMO, rich in fibers and Vegan, packaged in a resealable pouch, Nature Addicts is the perfect on-the-go treat for a break or to grab for the rest of the tour. "We are delighted to partner with the 5 Boro Tour, a wonderful initiative and to offer cyclists to snack with our 100% natural fruit sticks," says Olivier Sonnois, team leader at Brands Within Reach. 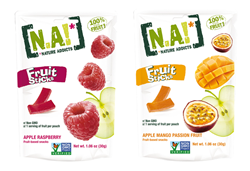 Nature Addicts launched its first non-sticky fruity snacks in the US in the end of 2015 and has grown successfully ever since. It has transformed the world of snacking by creating the first 100% natural fruit snack. Its fruit and fruit range has recently been accredited by the Non-GMO Project Verified label.